We’ve been having some crazy weather this summer! Well, it’s really been crazy for months now, but this summer has been interesting. TONS of thunder and close, powerful lightning like I’ve never seen before. I even know someone whose house was struck. Scary stuff! Thanks to some of the insanity, I wasn’t able to grill this chicken dish like I planned. Didn’t matter because it was equally delicious cooked in the oven. Fresh garden basil always makes things better 🙂 And the leftovers were perfect the next day tossed together for a great lunch to bring to work. Love this dish!! Place chicken in ziploc bag and combine with other ingredients. Shake to evenly distribute and let marinate for at least 3 hours. Combine all bruschetta ingredients in a bowl and let sit in the fridge for at least a few hours. Spoon bruschetta over each piece and serve. This entry was posted in appetizers, chicken, condiments, main dishes, mozzarella, QuickAndEasy, tomatoes. Bookmark the permalink. 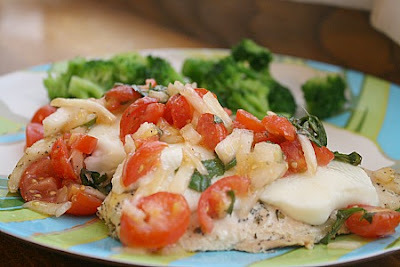 Love the fresh flavors in that bruschetta topping! This looks so delicious! Perfect for a summer supper…can’t wait to try it! I love bruschetta and this variation sounds wonderful!